This week the amazing Anna, who is always a huge source of inspiration to me, set the challenge to "One for the boys" at the High Hopes Challenge blog. Diese Woche setze Anna, die für mich immer eine Quelle an Inspiration ist, die Challenge auf "Eine für Jungs" auf dem High Hopes Challenge blog. Now isn't this stamp absolutely cool and funny?! I love this High Hopes ant and it was so fast to colour :) I used my water soluble pens, Twinkling H2Os and Spica glitter pens for the colouration. I also added a lot of frosted lace stickles to the cupcake. The sentiment is from the german Whiff of Joy Party and birthday text set. I stamped it on white cardstock and airbrushed the background with the Copic system. I also used a cuttlebug embossing folder on the brown cardstock and a Martha Steward border punch for the zig zag. The background paper is from My Mind's eye "Bella Bella" collection. It is so beautiful! Ist der Stempel nicht absolut lustig und cool?! Mir gefällt die kleine High Hopes Ameise super gut und sie war so schnell zu colorieren :) Ich habe Aquarellstifte Twinkling H2Os und Spica Glitter Stifte verwendet. Ausserdem ist auf dem Muffin noch jede Menge frosted lace Stickles. Der Text ist von dem deutschen Whiff of Joy Party und Geburtstagstexte Set. Ich habe es auf weissen Cardstock gestempelt und anschließend den Hintergrund mit dem Copic Airbrushing System besprüht. Den braunen Cardstock habe ich mit einem Cuttlebug embossing folder geprägt und den Zig Zack mit einem Martha Steward border Stanzer ausgestanzt. Das Motivpapier ist von My Mind's Eye "Bella Bella" und ist soo schön. 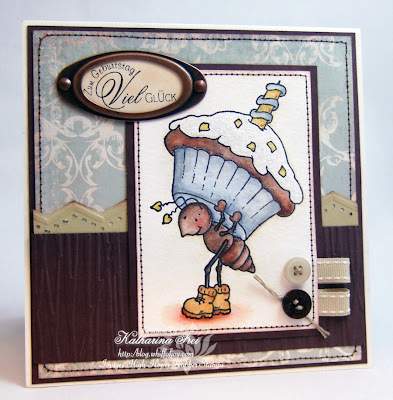 I am also entering this card to the Spoon Full of Sugar challenge with the theme "Buttons Galore" and the Papertake Weekly challenge "Animal Antics". Ich reiche meine Karte ausserdem noch bei der Spoon Full of Sugar challenge mit dem Thema "Knöpfe im Überfluss" und der Papertake Weekly challenge "Tiere" ein. Beautiful card, love the image and the colouring is wonderful. Eine supertolle Karte ist das. Toller Stempel und eine wunderschöne Karte!! What a great image and a beautiful card with such wonderful colours. Thanks for joining us at A SpoonFull of Sugar this week. Oh such a cutie love your card! Beautiful card Katharina! Love the image and your colroing is so fabulous! Beautiful card Katharina. I love that image nad great colours. Allthough I actually hate ants, I admit that this one was the cutest one I have ever seen! Your coloring is fantastic, and I love the layout and the details on this card! ooooooooh, love this card. Perfect 'boy card'. That image is brilliant and is wonderfully coloured. Great layout too. This is a beautiful card. Who knew an ant can be so elegant?! But you pulled it off :-) I think I just got those papers...I may have to pull them out! Cute stamp, love the card. Aww cute stamp, fab colouring,love the layout too. Gorgeous card Katharina, and coloured so beautifully! Such a fun card! Amazing colouring and gerat layout. Voll suess! Thanks for sharing your work...I always enjoy reading your blog! Aesthetically marvelous card! Love the image colouring. I love this colorcombination for a male card! Super nice image, great sketch and Í adore the way you used the ribbon and buttons. 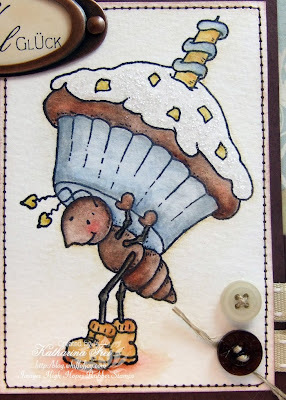 Gorgeous card, cheeky ant running off with that fab cupcake. Love your card Katharina! Beautifully coloured and designed! Katharina, I can't believe how much class you can give to an ant stamp! LOL! I love the glittery icing, the colors you chose and your expert touch with the pencils. Also the other textures and layers you added. You're amazing! Aww this is so cute Katharina! Thanks for joining us for the PTW challenge!